MANILA, Philippines - The official results, list of passers, top examinees, performance of schools and other important announcements for March 2018 Licensure Exam for Teachers (LET) both for elementary and secondary levels are released by the Professional Regulation Commission (PRC) 40 working days after the board exams. 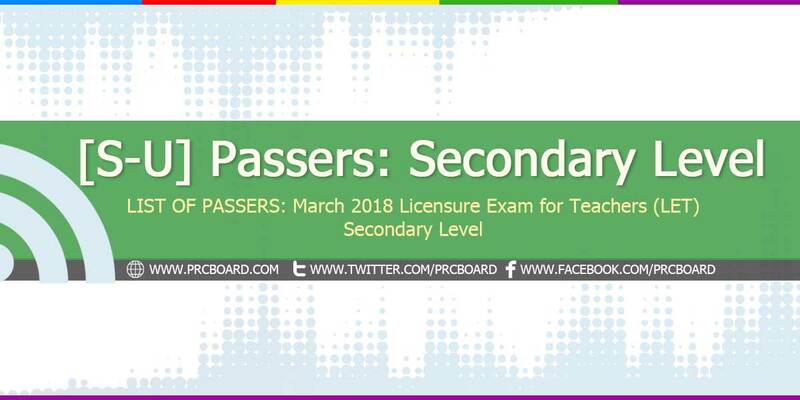 Below is the list of passers for March 2018 LET (Secondary Level) with surnames starting with letters S-U. Lord, its your will. ..
Congrats po ma'am Kat! Blow out! Anong oras pa. Ba to ilalabas? Kaninang 1am pa ako nakaabang, wala pa nga akong tulog tapos hanggang ngayon wala papa rin! Wala stable internet connection sa sister in law ko kaya ako ang pina check nya ng result. Eh ang tagal, grabe tuloy pati ako kinakabahan sa resulta XD. Papasa ako! With God's will , nothing is impossible! congrats to all LET PASSERS..
MAKAPASANA NA PO SANA ANG MAMIIE KO! MA. ANGELICA S.P SANTIAGO. SANA MAKAPASA NA ANG MAMIIE KO. MA. ANGELICA S.P SANTIAGO! Wala pa rin po? Nakakajerbs na po paghihintay. Hoping ma brotha to pass. Tagal naman. Mahigit isang araw na akong di natutulog. Pls Lord sana makapasa ung mga kaklase q at best friend q..
Lord pls Give ereward mo na po to k roswyn he will be such a responsible educator at sana makapasa din po kaklase q! Welcome to all new LPTs!!! See u all the oath taking. God is good, all the time. In Jesus Name.. Please Lord. I trust in you. TAWANG TAWA KO SA MGA NAGCOMMENT DITO HALOS LAHAT SILA HINDI NAKAPASA! BAKIT? NAAALALA LANG ANG DIYOS PAG MAY KAILANGAN EH !! !